Yes, our beads work with and fit major popular design lines. 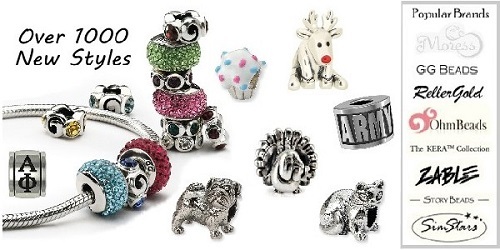 Generous Gems has an unmatched selection of bead charms for your bracelet or necklaces. We carry Zable, Reflections (by Simstars), Moress, Nagara, Reller, College Beads, Kera Beads, Ohm Beads, Story Beads and GG Beads. Each Simstars bead charm has been created, so that you can express yourself in your jewelry. Whatever the occasion, change the style of your jewelry to suit your mood or outfit. A Simstars bracelet or necklace looks great in any situation, from casual trips out, to enhancing your favorite ball gown. All our beads are made from Sterling Silver, 14 carat Gold and hand blown glass. We pride ourselves on fantastic design. Let your imagination run wild. Simstars are compatible with most other brands. Simstars produce over 900 handcrafted beads using Sterling silver, 14 carat gold and handblown murano glass. Our beautiful beads allow you to create a unique bracelet or necklace, which you can change to match your outfit or mood. You can select beads that mean something to you..... beads that tell your story. Each silver and gold bead is originally handcrafted in wax by our team of skilled craftsmen, from which the finished beads can be cast. The glass beads are handblown and have a solid silver core which is threaded so that they can twist onto our bracelets and necklaces. Likewise the silver and gold beads have a threaded core, which stops the beads from falling off the end of the chain. We also have a wonderful range of beads which feature natural gemstones including diamond, ruby, garnet, amethyst, pearl, pink tourmaline, peridot, turquoise and onyx. Some beads also feature high quality cubic zirconia and swarovski crystals, as well as hanging beads to really enhance the look of your bracelet. We introduce new styles throughout the year, keeping the range fresh, and giving you more ways to express yourself . Whilst being a patented system, our beads are compatible with other leading brands, and we pride ourselves on being excellent value for money. Generous Gems also carries Zable Beads. Zable® is the latest and greatest in the world of charms. Our sterling silver beads interchange to form a unique piece of jewelry. The beads slide right onto the starter jewelry so that anyone can easily create their own collection. With over 600 styles to choose from, no two collections are the same. Everyone's jewelry tells a unique story. Developed by Zoppini Firenze, Zable® jewelry is manufactured in Italy of the highest quality. Our bestselling Murano glass beads are unparalleled in detail and beauty, featuring genuine 24K gold and sterling silver foil. Don't settle for imitations - our glass actually comes from Murano, Italy! Zable® is sold exclusively through fine retailers worldwide, including Generous Gems.